The Botanical Garden from my city has six greenhouses (hothouses) including an aquatic one that has the Amazoninan Lotus. Unfortunately only three out of six are open for public and there is a Cactus one and another of Carnivorous plants that I always wanted to see. I even thought of a "master plan" where I pretend I am Botanics student that has to do somekind of project for school. Or maybe I should make friends with one of the ladies that works there.. Well, that's that. My favorite is the one with Mediterannean and Australian plants. There is a huge Citrus plant that has pink flowers that last for months and grow all over the glass roof. That spot of pink next to the blue sky is just mesmerizing. Everytime I got there I like to walk around barefoot. But only when there are not many people around. I feel closer to nature surrounded by all those exotic plants. In the last few months I visited the greenhouses three times and took beautiful film shots there. But these days my sister from Portland is visiting and she took some pictures of me. I like them a lot. And even if I usually post here only pictures took by me, I really want to share this too because the way she capturead the beauty of this "caged garden" is really amazing. And of course I had my Canon Ae1 with me. That camera is almost a part of me. :) I also took some shots but my film is still at the studio waiting to be processed. All pictures by my sister Cami Farcas. More of her work here: camiphotography. love this photo shoot, especially the first two, 4th and last :) the botanical garden is such an amazing place for photos, especially the greenhouses! 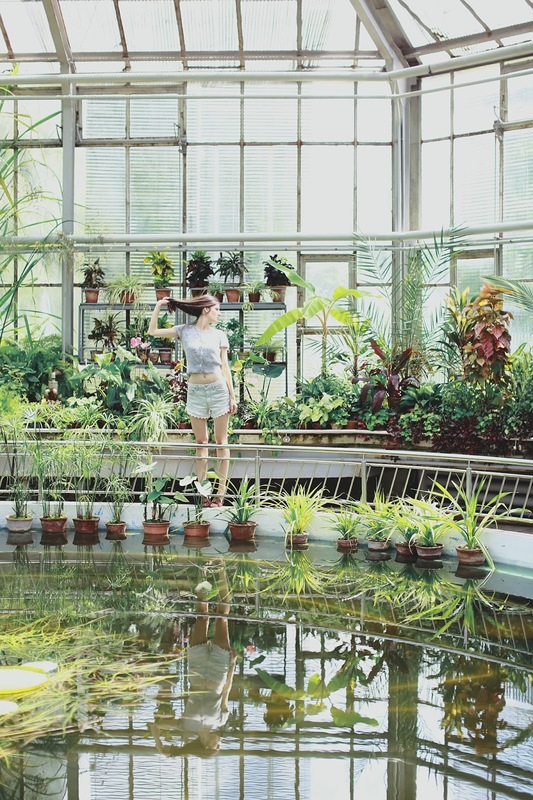 you are right Daria :) the greenhouses are amazing for pictures. too bad you cannot visit all six of them :( thank you. a also love my sister's photography!